Government debt yields sank Thursday after the Labor Department said consumer prices rose less than expected in September, calming inflation fears that sent the 10-year Treasury yield to its highest in seven years earlier this week. The headline consumer price index came in at 0.1 percent, short of the 0.2 percent anticipated and following August's 0.2 percent gain. Excluding volatile food and energy components, the CPI edged up 0.1 percent for the second straight month, bringing the year-over-year gain in the core figure to 2.2 percent. The yield on the benchmark 10-year Treasury note fell to 3.14 percent at 4:06 p.m. ET, down from 3.19 percent immediately before the CPI release. The yield on the 30-year Treasury bond dropped to 3.317 percent. Bond yields move inversely to prices. The 10-year Treasury yield has climbed about 15 basis points to multiyear highs over the last seven days amid a report Friday which showed the lowest unemployment rate in 49 years, along with rising wages. Recent employment reports have added to the now-widespread view that the labor market is near or beyond full employment and have started to show acceleration in wage growth. That could be a worry for the Federal Reserve trying to keep a lid on inflation. Though consumer prices came in softer than expected, the print is unlikely to impact market expectations for a fourth rate hike from the Federal Reserve before the end of the year. "CPI was a miss, but it doesn't necessarily portend broader inflation trends," said George Goncalves, head of fixed-income strategy at Nomura Securities International. "As the Fed is watching this information come in over the months, you get mixed reads, so this does not stop them. They're making their way to their neutral rate." As of 3:58 p.m. ET, expectations for a hike at its December meeting held around 78 percent, according to the CME Group's FedWatch tool. Equity markets around the world slumped Thursday. Asia-Pacific stocks saw sharp declines by the region's market close, while European shares tumbled in its morning trade. In the U.S., futures tanked following on from a sharp drop seen in the previous session where the Dow closed more than 800 points down. Markets have been jittery as interest rates continue to climb. 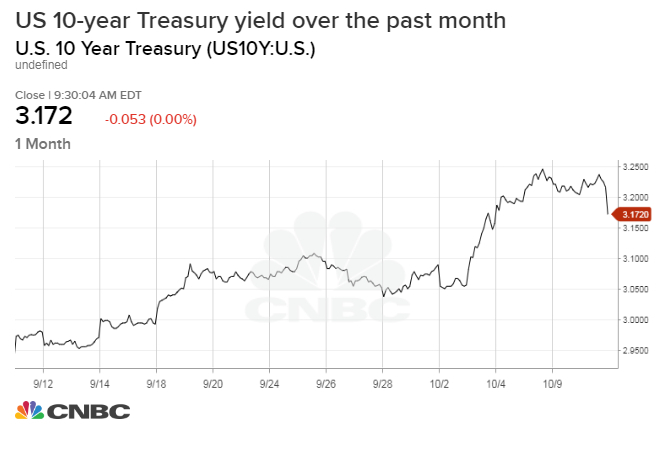 While Treasury yields inched lower on Wednesday, this comes after the benchmark 10-year Treasury yield clinched a fresh seven-year high and the 30-year bond yield reached a high not seen since 2014 during the course of Tuesday's trade. Concerns surrounding rising interest rates continue to keep investors on edge, as strong economic data fuel jitters on what this could mean for the future of U.S. monetary policy and therefore the economy. The Treasury Department auctioned $15 billion in 30-year bond at a high yield of 3.344 percent. The bid-to-cover ratio, an indicator of demand, was 2.42. Indirect bidders, which include major central banks, were awarded 64.4 percent. Direct bidders, which includes domestic money managers, bought 12.8 percent. Following the central bank's move to hike rates a third time this year, Fed Chair Jerome Powell said in an interview with PBS that U.S. monetary policy is "far from neutral," suggesting front-end rates have further room to rise. "Interest rates are still accommodative, but we're gradually moving to a place where they will be neutral," Powell said added. "We may go past neutral, but we're a long way from neutral at this point, probably." In the latest surrounding the topic, President Donald Trump criticized the Federal Reserve on Wednesday, saying that the U.S. central bank was "making a mistake" for continuing to increase interest rates. "The problem [causing the market drop] in my opinion is Treasury and the Fed. The Fed is going loco and there's no reason for them to do it. I'm not happy about it," Trump went on to say in a separate telephone interview with Fox host Shannon Bream. "Loco" means "crazy" in Spanish. "The loco part: that was a new one," Nomura's Goncalves added. "I don't place much value in it; the Fed will continue to do what's necessary to keep in the economy from overheating. They're just trying to get the frothiness out." "If they don't lean against it, it can be much worse later on." — CNBC's Alexandra Gibbs contributed reporting.